In addition, the business has the ability to set cancellation rules and fees to the system. See the Changes & Cancellations section under Business Information for more information about set up. To cancel an existing reservation using Frontdesk, find and open the reservation. Scroll down to locate the cancel button at the bottom of the page (buttons below Customer Comments). Click Cancel reservation. The next screen will display that the reservation has been cancelled. When cancelled, you will see a notification at the top of the booking indicating it was successful and the Status of the booking will be updated to "Cancelled". If you allow your customers to cancel a booking, then they can do so using the MyReservations link. Usually, you will add this link to your confirmation email with instructions on how to cancel. 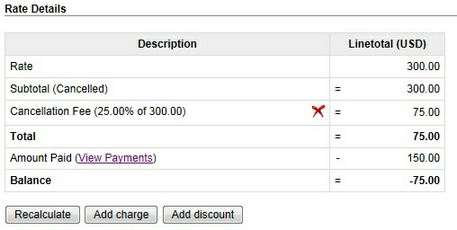 If needed, you can remove the cancellation fee by clicking on the red X (delete icon) on the cancellation fee line. Please note that once you remove this fee from the reservation, it cannot be undone. If you need to add the fee back to the reservation, you will need to Save the reservation and Cancel it again. When a reservation is cancelled, the Booking System calculates the cancellation fee as specified in the cancellation rules. Security deposit, if specified, is removed from the total amount prior to calculating the cancellation fee as security deposit only is used when a guest/customer fulfills the rental (since there is no rental, there is no need for security deposit either). Once a reservation has been cancelled, you can view the outstanding balance in the reservation. The balance is calculated as cancellation fee minus accepted payments. In the example above, when the reservation was cancelled, the cancellation fee was calculated on the subtotal rate and removed the security deposit amount and the tax. The balance will show a negative number when there is an amount due to the customer. Payments and Refunds on Cancellations: The system does not automatically charge the cancellation fee or refund balances when a reservation is cancelled. To settle the balance, go to the Payment Information section of the reservation. 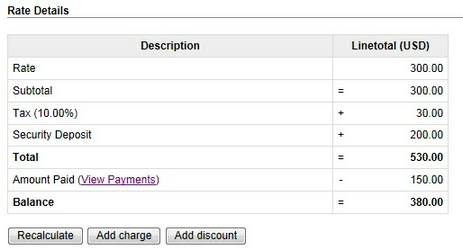 If you need to charge the customer a cancellation fee, click Add Payment. For refunds, click Refund Payment. This will take you to ePay Virtual Terminal where you can process the charge/refund.